The Lincoln MKT has surprisingly daring styling and sells in such small numbers that it can draw some stares out on the road, but not for the reasons usually welcomed by drivers. In fact, it's quite possible that the daring styling directly explains the slow sales. Nonetheless, the MKT is a competent three-row crossover SUV that checks nearly all the boxes once you're inside. The big seven-passenger utility vehicle has a polarizing, brash look that has it stand out from boring large crossovers in the almost-minivan crowd. We'll admit to being fans of the look—some of us, at least—especially since a 2013 update brought a slimmer grille and new headlamps. Not much else needed changing, really. The MKT feels at once modern and like a throwback to martini-era Lincoln land yachts of the 1960s, though it's essentially the same vehicle as the very boxy Ford Flex. The only universally disappointing aspect of the design is the relatively unfinished and heavy look of the tail, with its thin ribbon of taillights and badges. It and the silhouette remind some of a hearse, which Lincoln has embraced by offering a version of the large crossover to fleet customers, some of whom use them for that purpose. While the interior's classy design theme carried over during the 2013 revamp, it received improved materials as well as a new infotainment setup. The sea of matte metallic material was replaced by a darker look, with the new MyLincoln Touch infotainment sitting front and center, coupled with capacitive-touch audio and climate controls in place of conventional knobs and switches. (Lincoln has since realized the error in its future-thinking ways, and is bringing the tactile controls back to its lineup, starting with the compact MKC crossover.) Gauges were new in 2013 as well, with a reconfigurable cluster that can show some MyLincoln Touch information, like navigation instructions, right in front of the driver. Just as in the past, it looks closely coordinated from a detail standpoint. The MKT is offered with a choice of two powertrains. The standard version comes with front-wheel drive and a 3.7-liter V-6, while the optional engine, a 3.5-liter turbocharged V-6, is paired exclusively with all-wheel drive. Thankfully, neither will leave you wanting for the Sixties-era V-8s of Lincolns past. Models with the 3.7-liter six get twin independent variable camshaft timing (Ti-VCT), which helps raise output to 303 horsepower (35 more hp than before the 2013 refresh) and 278 pound-feet of torque. Based on what we've experienced of this engine in other vehicles, like the nearly identical Flex, it feels surprisingly strong and works well with its six-speed automatic transmission. All-wheel-drive MKT models with the EcoBoost V-6 make 365 hp and 350 lb-ft of torque as of the 2013 upgrade. This engine also sends power through a six-speed automatic. With a price only a couple thousand dollars higher than the base, front-wheel-drive model, this is the MKT to have. Power delivery is strong, smooth, and refined, with just a touch of pleasant engine noise. Both MKT models allow drivers to choose gears for themselves with steering-wheel-mounted paddle shifters, although the automatic transmission tends to grab the right gear quickly and smoothly. And while you might think paddle shifters are out of place in a big crossover like the MKT, they can actually add to the driving experience. Along with the nearly mechanically identical Ford Flex, this is one of the best large crossovers to hustle along backroads. It's a barrel-chested linebacker, and the capable suspension can handle a lot of roughhousing, even if some corners are just too tight for such a long car. Lincoln quickened the MKT's steering ratio for 2013, adding electric power assist at the same time. The EcoBoost model also received a three-mode continuously controlled damping suspension that can react quickly to changing surfaces and conditions. The suspension modes are controlled by Lincoln Drive Control, which also adjusts steering, throttle, transmission, and other settings within three modes. The driver can select between Normal, Sport, and Comfort modes, depending upon conditions, road type, and, we assume, passenger feedback. Lincoln upgraded the MKT's brakes in 2013 as well, both to match the added power and to address customer complaints regarding fade with the original setup. With the ancient Lincoln Town Car sedan now itself history, the MKT is not only the immediate inheritor to the throne, but also a particularly luxurious family wagon, with room for up to seven. The MKT is available in a six-passenger version with twin bucket seats in the first two rows and a two-seat bench in back, or as a seven-seater that replaces the middle row of chairs with a bench. In both the first and second rows, the MKT provides uncommon support and space in every direction. The front seats remind of those from Volvo (a high compliment indeed), and they're great for covering hundreds of miles in a day, with underlying firmness yet pillow-cozy comfort. Telescopic steering and a very wide range of seat adjustment provide a comfortable driving position for most. Even in the second row, you'll find copious amounts of legroom as well as plenty of headroom and big doors that make entry and exit easy. They're truly second-row seats built for adults, as opposed to the short, flat bench seats all too common in this kind of vehicle. Getting back to the third row can be a bit of a challenge for bigger folks, and six-footers will find headroom tight; but others will find the seats passable. Power-folding second-row seats with heating, cooling, and power-assisted lumbar adjustment are available, and when equipped, third-row passengers can fold the seats in front of them out of the way at the touch of a button, a nice feature. Behind the third row there's about as much cargo space as you'd find in the trunk of a large sedan, at 17.3 cubic feet. Fold down the third row and the total rises to 39.6 cubic feet. After folding both of the rearward two rows of seats, you can get a van-like 75.9 cubic feet. The MKT has been rated well for occupant protection, and it's equipped with many advanced safety features. Each MKT has standard front, side, and curtain airbags (which extend through all three rows); stability and traction control; anti-lock brakes; a rearview camera; a blind-spot alert system; and adaptive headlamps. Also on the list is a rear seatbelt airbag system for those in the outboard positions of the second row; the inflated belt helps spread impact force across a wider area of the wearer's body. 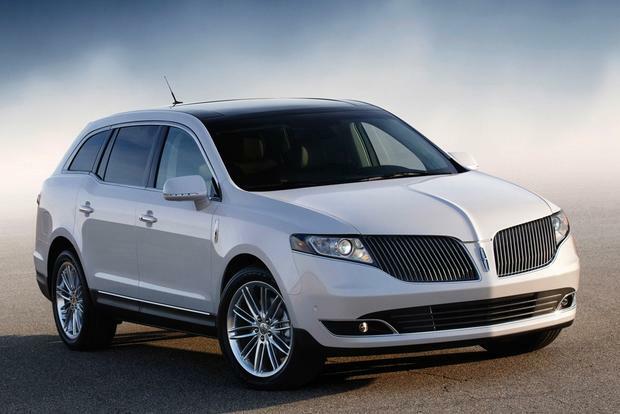 The Insurance Institute for Highway Safety (IIHS) has given the Lincoln MKT its top "Good" score in the four categories it has tested the crossover in; the MKT has not yet been subjected to the new small frontal overlap test and therefore is not eligible for the agency's Top Safety Pick status. The federal government hasn't rated the MKT since it rejiggered its tests for the 2011 model year, but the crossover was previously a high achiever in those evalutaions as well. In addition to those standard safety items, options include Active Park Assist, which uses cameras and sensors in conjunction with the electric power steering to steer the vehicle into tight parallel parking spots; Lane Keeping Assist, Collision Warning, Adaptive Cruise Control, and a Blind Spot Information System (BLIS) are all available, as is the MyKey system that lets parents program certain vehicle settings for teen drivers. As for other features, if you stick with the default spec for the MKT, you likely won't be let down; it includes a large fixed-panel panoramic sunroof; dual-zone climate control; Lincoln SYNC; MyLincoln Touch; a keyless entry control pad located in the door frame; remote start; high-intensity discharge headlamps with automatic high-beams; heated and cooled 12-way front seats; seven-passenger seating; and push-button start with MyKey. The only option available on the 3.7-liter model is the inflatable second-row safety belts. Stepping up to the more powerful engine and all-wheel drive also opens availability of several options and packages. The EcoBoost model can be optioned with heated, cooled, and powered second-row seats, which make the MKT a six-seater. The Elite Package, which is only available on the EcoBoost model, adds the power-folding third-row seat, HD Radio, a THX II-certified audio system, a heated steering wheel, and voice-activated navigation. With the Technology Package, which requires the Elite Package, you also get Adaptive Cruise Control & Collision Mitigation, Active Park Assist, and Lane Keeping. On top of that, you can add a rear-seat entertainment package, as well as a second-row refrigerator console for six-seat models; with that, you might just become everyone's favorite chauffeur, though. Other options include a power panoramic roof, 20-inch wheels, and a tow package. Add a few options to the EcoBoost MKT and you can slip past the $50,000 mark. The Lincoln MKT is by no means a very fuel-efficient vehicle, but when you consider its spacious interior and three useful rows of seating, it's easier to accept the numbers. With front-wheel drive and the normally aspirated 3.7-liter V-6, the MKT returns ratings of 17 mpg city, 25 highway. With the turbocharged 3.5-liter EcoBoost engine and standard all-wheel drive, the ratings drop to 16/23 mpg. Ford has pressed the MKT into fleet duty, attempting to replace its old Town Car sedan. In livery guise, the MKT can be fitted with a 235-hp EcoBoost four-cylinder that achieves 20 mpg in the city, 28 highway, with front-wheel drive only. There's also a 3.7-liter all-wheel-drive model especially for fleet customers, which is EPA-rated at 17/24 mpg. But the brand has no plans to offer either powertrain combo to the public.